Mitra, as a god of justice is the Archangel Michael’s prototype. Mitra does not appear in the Gathas, but later appears in the Avesta. In the last days of the Persian Empire, in addition to Ahura Mazda, Mitra and Anahita, goddess of the waters, were also worshipped. The Romans commemorated Mitra as Sol Invictus, the Unconquered Sun. All the Platonists were students of both Zoroastrian soothsayers and mystical Mitraism. In Greek inscriptions, Mitran priests were named Magus. The three Magi who came to visit the birthplace of Jesus were Mitran priests. Zoroaster stated that the Lord God is Light; which had already been said by Moses. The Prophet Mani (3rd century CE) taught that light was spiritual, hence good and that darkness was material, hence evil. Again Mani preached that there is a spark of light within every human and in that lies the hope of salvation. Mazdak (6th century CE) stressed the pure nature of fire, soil and water. Also, Islam teaches that Allah is light both on this earth and in the heavens. In the 6th century BCE, Zoroastrianism became the officially recognised state religion of the Persian Empire and was therefore practised over a vast area, from Greece to Egypt and northern India. During the Sasanian era, (3rd to 7th centuries CE), Zoroastrianism continued as the established religion of the country. However, while the Persian Empire showed tolerance toward various faiths, the Sasanians were intolerant of other beliefs. In this period, Zoroastrian priests held the most significant power after the monarchy, and this shook Zoroastrian faith. Zoroaster preached the doctrine of two spirits but his philosophy was not truly dualistic. Dualistic thinking was introduced into the religion at later stages, during the Sasanian era. And later, Zurvanism, which is a modified form of Zoroastrianism, brought out Ohrmazd and Ahriman as the dual jointly eternal principles of good and evil. Ohrmazd is good through his own nature, while Ahriman is evil; the former is the Creator, the latter is the Destroyer. Zurvanism is intrinsically contrary to genuine Zoroastrianism because it is pessimistic and fatalistic. This dualistic doctrine gradually took the place of the monotheism expressed in the Gathas. Following the Arab invasion and occupation, those loyal to Zoroaster fled, carrying with them Iran’s sacred flame, and took refuge first in the hills of Khorasan, and when found there, on the Isle of Hormoz. On suffering persecution there, they escaped by ship to India. It is said that one group travelled overland through the Punjab. The Hindu Prince in south Gujarat allowed them to settle there and awarded them a site on which to build their fire-temple. In return, the Zoroastrians promised to live in peace with the native population, to assist them in time of war, to adopt native dress and language and to make appropriate changes in their marriage customs. The immigration to India took place between the 8th and 9th centuries. The descendants of Persian Zoroastrians in India are known as Parsees. Their name means Persians. Today, most of them live in Mumbai, Bangalore (Karnataka) and Karachi (Pakistan). 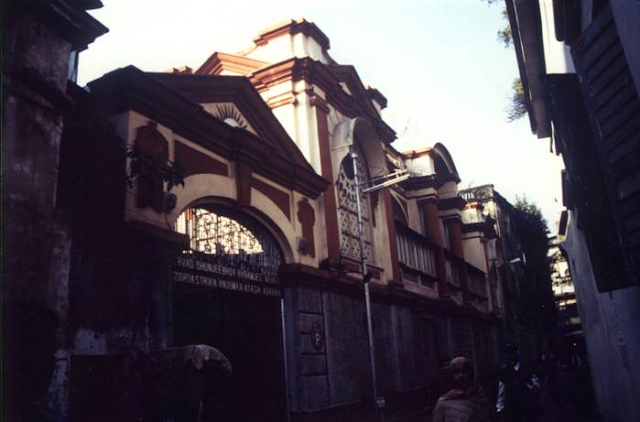 India – Kolkata, Parsee Temple. Avesta or Zend Avesta (the Zoroastrian scriptures) is the sacred books which codify or systematise the teachings of Zoroaster and set out the practices of religious services. It is said that the original books were lost when Alexander the Great burned down the royal palace of Persepolis in 331 BCE. The Avesta of today was put together from the surviving fragments of the original texts during first the Parthian and later the Sasanian eras. It comprises five sections: the Gathas are the songs or hymns composed from what were thought to be the sayings of Zoroaster; the Yasna sets out the major act of worship; in the Vispered are found the oaths of allegiance to spiritual leaders; the Vendidat codifies the rules of Zoroastrian faith regarding both acts of worship and behaviour in life apart from formal worship; the Yashts (the Parsees liturgical book) comprise 21 hymns and recount the legends concerning angels and ancient heroes. The Gathas are very different from the other sections of Avesta, whose texts are composed from the oldest surviving fragments of the original, and date from the time of Zoroaster. The author of the Gathas, which contain Zoroaster’s life philosophy, is not known for certain. The hymns are thought to have come down to the present virtually unchanged over the centuries. The language used in the original Avesta was Avestan, an ancient Iranian language. Later in the 9thcentury CE texts written in Pahlavi, a dialect of Persian. It is claimed that, in the Pahlavi commentaries, religious ideals were devalued and the ancient Gathas, Yasna and Yashts contained more uplifting thoughts. Dead bodies are considered to be where Angra Mainyu holds sway, so they cannot be buried in the ground, nor at sea. They cannot be cremated either, in order not to pollute the earth, sea and fire. In all the rituals performed for the dead, the “Tower of Silence” plays a vital part. The Tower of Silence, tall, cylindrical and open to the sky above, are enclosed in a thick wall. The only entrance is through a door on the east side of the wall, which is kept locked. Inside, it comprises three concentric circles, for men, women and children. The naked corpse is placed within, where it is exposed to vultures who pick the bones clean. Once dried by the sun, the bones are then swept into a central well. Just in the centre is a deep, round crater, at the bottom of which are spread sand and coal dust, layer upon layer, acting as a filter for all the fluids which drain into it. Thus, all liquids soaking into the soil are filtered and rendered harmless. The dead, who cannot be touched by anyone save the body-bearers, are carried into the tower on stretchers during the hours of daylight. The porters of the dead are a special class of people who are cared for and paid regularly by the community for this specific purpose, and who do not undertake any other duty but this. The funeral procession is followed by close relatives as far as the Tower of Silence, but no one except the corpse-bearers can enter. Feeding carrion birds with the flesh of dead bodies displays the Zoroastrian concept of virtue. The soul is presumed to have left the body by the fourth morning after death, and to have reached the next world and presented itself for judgement. The Towers are located near to the city but are built on high ground far from human habitation. No memorial is erected for the dead. The most important part of the Zoroastrian death ceremony is the prayers said for the departed whose anniversary of death is always commemorated. Each family pays tribute to its dead with fire, frankincense, offerings and the recital of Gathas. The first month of the year is named after the dead. They hold six seasonal feasts, one of which is for the dead. Decrease in the Zoroastrian population and depletion in the number of vultures as a result of urbanisation have led to a greatly reduced number of Towers of Silence operating. A few Towers of Silence are still in existence in Tehran, Yazd and Mumbai. However, toward the middle of the 20th century, their traditional use in Iran was brought to an end. Zoroastrians will be obliged to find solutions, such as the use of chemicals, which do not violate their basic religious principles. 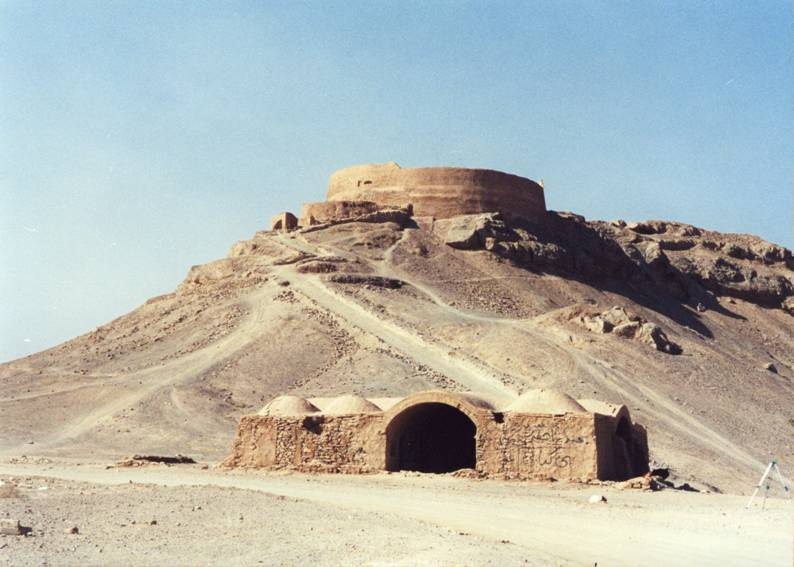 Iran – Yazd, a Tower of Silence.